↑ Olson, Judy M (1997), "Projecting the hemisphere", in Robinson, Arthur H; Snyder, John P, Matching the map projection to the need, Bethesda, MD: Cartography and Geographic Information Society, American Congress on Surveying and Mapping External link in |title= (help). 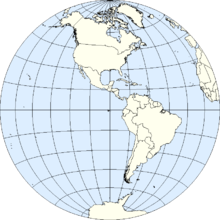 ↑ "Western Hemisphere", Merriam-Webster's Geographical Dictionary (3rd ed. ), Springfield, MA: Merriam-Webster, 2001, p. 1294 . หน้านี้แก้ไขล่าสุดเมื่อวันที่ 16 พฤศจิกายน 2561 เวลา 22:36 น.